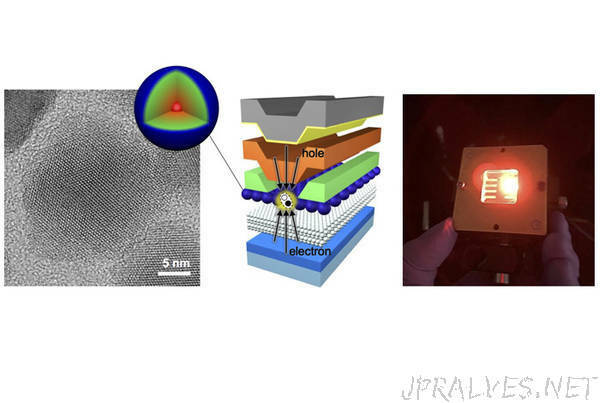 In the new report published today in Nature Materials, the Los Alamos team demonstrates that using their “designer” quantum dots, they can achieve light amplification in a nanocrystal solid with direct-current electrical pumping. The key property of the novel quantum dots, underlining the success of the conducted study, is a carefully engineered particle interior in which the material’s composition is continuously varied along a radial direction. This approach eliminates sharp steps in the atomic composition which would normally trigger Auger recombination. As a result, the engineered quantum dots feature nearly complete suppression of Auger effect’s heat loss, and this allows for redirecting the energy released by the electrical current into the light-emission channel instead of wasteful heat.